← 19 more spaces for CC#39, Barnwell SC, March 2017. Continuing in our ‘Made in America’ series, I present the Barrett single shot bolt action, chambered in .50 Browning Machine Gun (BMG), a classic cartridge that John Browning designed 97 years ago, which is still in current US military service today. Originally conceived of as an anti-tank round in 1919, it was the standard aircraft cartridge of the US in WWII. The rounds we fired in my back yard today were AP rounds loaded to 13,000 ft/lbs of energy. That is more than ten times what a 5.56 NATO packs. It was an interesting experience in ballistics and metallurgy. Above the Barrett, with one round laying under it. It weighed about 25 pounds. 13K pounds of energy on a rifle this light would not be manageable without a muzzle brake (the device on the end of the barrel) which deflects gasses backwards to remove most of the felt recoil. It honestly wasn’t that bad, roughly like a 3-1/2″ 12 gauge magnum shell in an 870. 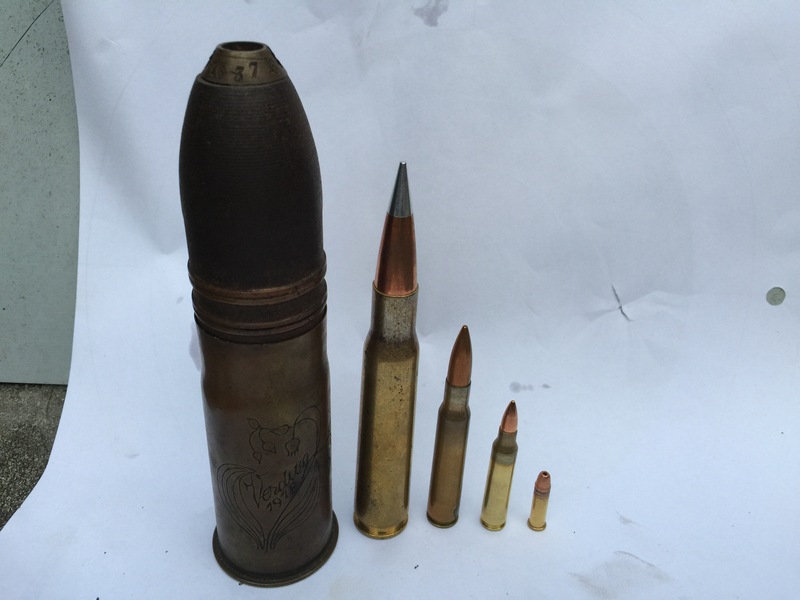 Above, Size comparison: The .50BMG is the second from the left; next is a .30-06, a 5.56 NATO, and a .22LR. The large item is a 37mm Vickers “pom-pom” round from WWI. It was personally brought back from the trenches of France by my grandfather, pictured here: A clarification and a century old story. If you look closely, it is engraved to say “Verdun 1918”. Above a 6 second video of shooting a steel flywheel in front of an aluminum plate. As a pair, the weigh more than 100 pounds, but the round flips them over. My neighbor Ryan at the trigger, Vern is speaking in the background. Above, a steel flywheel from a GM-6.5L diesel. 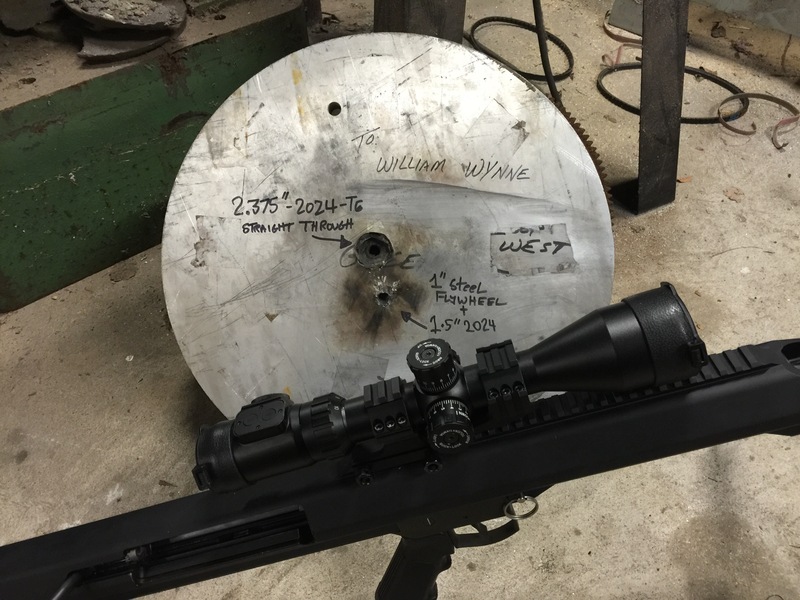 The first shot went right through a section 1.375″ thick. 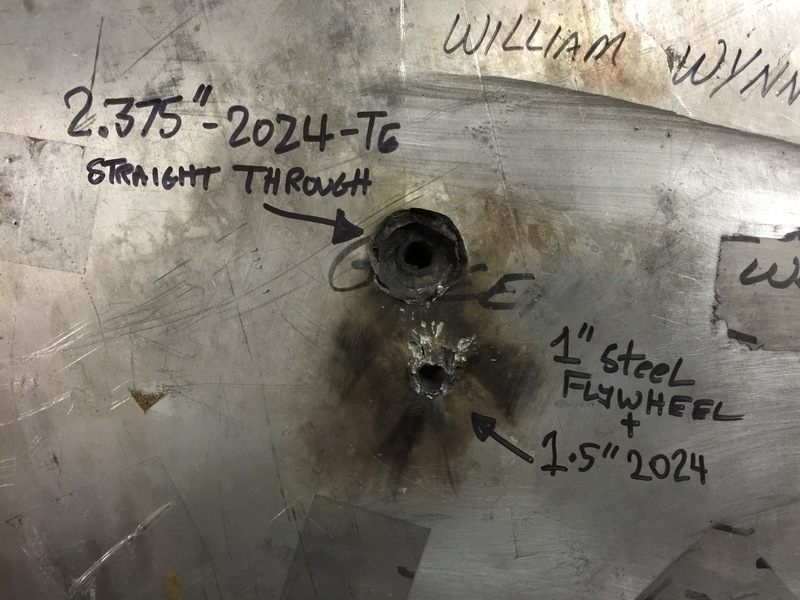 The second round is pictured, which went through the flywheel, then penetrated 1.5″ of 2024 aluminum, but retreated about an inch. This was the shot pictured in the video. Picture a P-51 Mustang with six browning M-2’s firing a three second burst: that is 250 rounds just like the one above. If you know how aircraft are built, it is unimaginable how any opposing fighter could withstand that. Look closely and see the bullet is just slightly deformed. At the start of WWII, most of the worlds fighter aircraft used .30 rifle ammunition, with a tiny fraction of this power, as standard armament. In the US, an outspoken visionary of airpower, Alexander P. de Seversky, stated that all US fighters should have 2,000HP and eight .50BMG guns. This was considered outrageous, but the P-47 was his brainchild, and he essentially understood the concept of a “fighter-bomber” long before others. Looking in person at what a few single rounds can do against metals gives great understanding of why light armored vehicles and locomotives stood little chance against strafing with .50BMG. Above, a look at the 2.375″ thick plate. The fist round had no problem cutting straight through the aluminum, and the front 8″ of wood in the backstop. 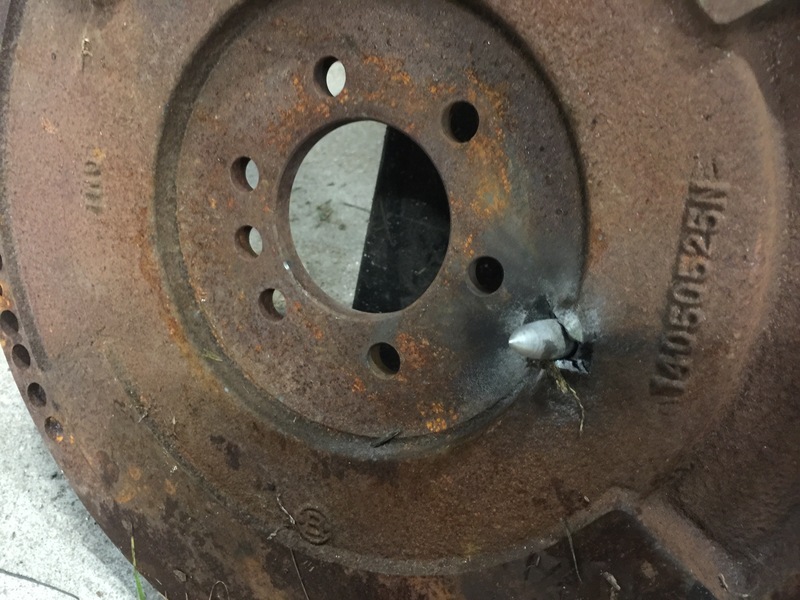 The second hole is 1.5″ deep, and this was after it had gone through the flywheel in front of it. It gives perspective on why six .50BMG guns was still considered plenty of firepower for F-86’s to shoot down 792 MiG-15s in Korea. I have personally worked on MiG-15’s and there isn’t any structural material in one that a .50BMG couldn’t cut right through, and the plane has an enormous amount of single point failure hoses, etc. Above, a look at an American made rifle, using an American designed cartridge, which has long played a part in our history. As interesting as this was, it was not lost on us that today was the 75th anniversary of Pearl Harbor, and countless Americans, then and since, have faced terrible hours in the presence of .50BMG gunfire. It is a small comfort to understand that our nation had designers, engineers, craftsmen and warriors who had the understanding, capability and presence of mind to equip our forces a superior and reliable cartridge that played a role in their success and return home. Now you are talking. A favorite cartridge. 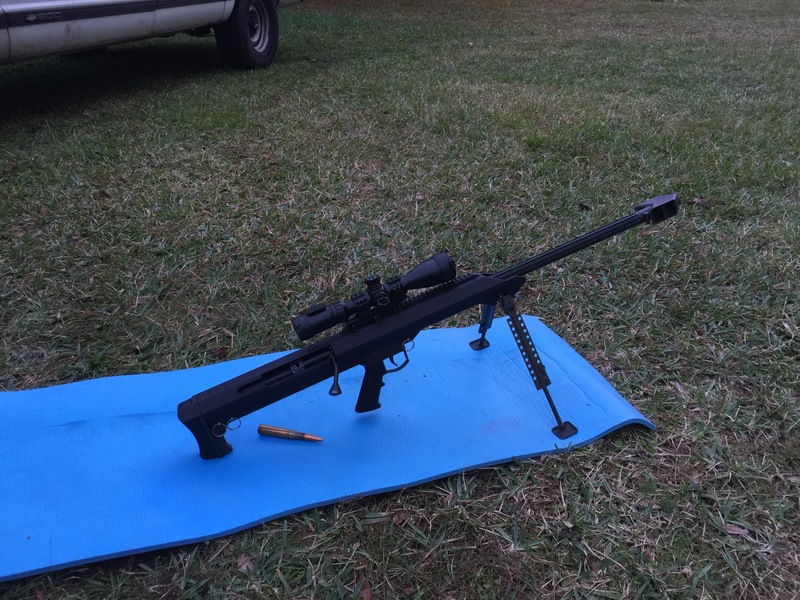 Similar to a scaled-up .30-06. Built a .50BMG rifle at one time from a German Pzb39 action. Did kick some. If you used that without a muzzle brake, than you are one tough guy! A website that I find very informative did a video on the action you are speaking of, truly a small artillery falling block: https://www.youtube.com/watch?v=jupKqqqgBJM -ww.